Alexander the Great Persian Empire: Alexander the great was the king of Macedonia. His father was Phillip II and he was born in the ancient capital of Macedonia, Pella. Aristotle (Greek philosopher) was the mentor of Alexander the great. He taught him literature, science, medicine, philosophy, etc. After the assassination of the king of Macedonia, Phillip II, his son ruled the place. 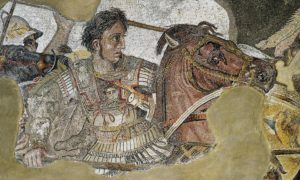 Alexander’s education followed the Greek principle of “a sound mind in a sound body.” He studied literature, philosophy, and politics, and he also received training in sports, physical fitness, and warfare. His official schooling ended abruptly at the age of 16 when his father called him away for duties in the government. Alexander first took Greece under his control and then advanced towards Persia. His army won the battle against the Persians. 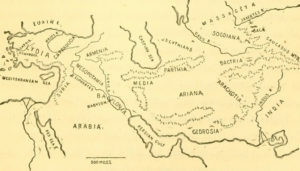 Alexander then reaches Syria in 333 B.C. where he defeated Persian king Darius III but, unfortunately, could not capture him. Alexander the great then went to Egypt. The Egyptians welcomed him as a liberator from Persian rule, and they crowned him pharaoh. On the western edge of the Nile Delta, Alexander founded a city in 331 B.C. and named it Alexandria after himself. During his conquests, he founded many cities and named them after himself ‘Alexandria’. For the next several centuries, these cities served to greatly extend Greek, or Hellenistic, culture in Persia. Alexander’s next and final conquest would be what is now known as India. He began in 327 B.C. and eventually acquired a significant portion. Alexander dreamed of continuing eastward where he hoped to find a great eastern ocean. But facing a minor political disturbance at home. He returned to Greece in 324 B.C. and died in 323 B.C. of fever due to exhaustion and wounds received in previous battles, leaving his dream unfulfilled. He defeated his Persian colleague Darius III Codomannus and conquered the Achaemenid Empire. Alexander effected a temporary integration of the Persians into his empire by enlisting large numbers of Persian soldiers in his armies and by causing all his high officers, who were Macedonians, to wed Persian wives. His death in 323BC was followed by a long struggle among his generals for the Persian throne. Alexander has no heir (though the posthumous son of one of his wives is formally referred to as the king until murdered in his early teens in 309). So Alexander’s generals set about carving up the new empire. The victor in this contest was Seleucus I, who, after conquering the rich kingdom of Babylon in 312BC, annexed thereto all the former Persian realm as far east as the Indus River, as well as Syria and Asia Minor, and founded the Seleucid dynasty. For more than five centuries thereafter, Persia remained a subordinate unit within this great realm, which, after the overthrow of the Seleucids in the 2nd century BC, became the Parthian Empire.